Fifty years ago, college was cheap, unions were strong and there was no terrorism-industrial complex. At a book festival in Los Angeles recently, some writers (myself included) were making the usual arguments about the problems with American politics in the 1950s—until one panelist shocked the audience by declaring, “God, I miss the Cold War.” His grandmother, he said, had come to California from Oklahoma with a grade-school education, but found a job in an aerospace factory in L.A. during World War II, joined the union, got healthcare and retirement benefits, and prospered in the Cold War years. She ended up owning a house in the suburbs and sending her kids to UCLA. All good points, of course. After all, during the Cold War the U.S. did threaten to destroy the world with nuclear weapons, supported brutal dictators globally because they were anti-communist, and was responsible for the deaths of several million people in Korea and Vietnam, all in the name of defending freedom. And yet it’s not hard to join that writer in feeling a certain nostalgia for the Cold War era. It couldn’t be a sadder thing to admit, given what happened in those years, but—given what’s happened in these years—who can doubt that the America of the 1950s and 1960s was, in some ways, simply a better place than the one we live in now? Here are eight things (from a prospectively longer list) we had then and don’t have now. The problem, of course, is the due-process clause of the Fifth Amendment, which prohibits “any person” from being deprived of “life, liberty, or property without due process of law.” It doesn’t say: "any person except for those the president believes to be terrorists." It's true that the CIA has admitted it had an assassination program during the Cold War—described in the so-called “family jewels” or “horrors book,” compiled in 1973 under CIA Director James Schlesinger in response to Watergate-era inquiries and declassified in 2007. But the targets were foreign leaders, especially Fidel Castro as well as the Congo’s Patrice Lumumba and the Dominican Republic’s Rafael Trujillo. Still, presidents preferred “plausible deniability” in such situations, and certainly no president before Obama publicly claimed the legal right to order the killing of American citizens. Indeed, before Sept. 11, 2001, the U.S. regularly condemned “targeted killings” of suspected terrorists by Israel that were quite similar to those the president is now regularly ordering in the Pakistani tribal borderlands, Yemen, and possibly elsewhere. That’s the term coined by Dana Priest and William Arkin in their book Top Secret America to describe the ever-growing post-9/11 world of government agencies linked to private contractors charged with fighting terrorism. During the Cold War, we had a handful of government agencies doing “top secret” work; today, they found, we have more than 1,200. For example, Priest and Arkin found 51 federal organizations and military commands that attempt to track the flow of money to and from terrorist networks. And don’t forget the nearly 2,000 for-profit corporate contractors that engage in top-secret work, supposedly hunting terrorists. The official budget for “intelligence” has increased from around $27 billion in the last years of the Cold War to $75 billion in 2012. Along with this massive expansion of government and private security activities has come a similarly humongous expansion of official secrecy: the number of classified documents has increased from perhaps 5 million a year before 1980 to 92 million in 2011, while Obama administration prosecutions of government whistleblowers have soared. It’s true that the CIA and the FBI engaged in significant secret and illegal surveillance that included American citizens during the Cold War, but the scale was small compared to the post-9/11 world. 3. Organized labor was accepted as part of the social landscape. You certainly wouldn’t catch Barack Obama saying anything like that today. Back then, American unions were, in part, defended even by Republicans because they were considered a crucial aspect of the struggle against Communism. Unlike Soviet workers, American ones, so the argument went, were free to join independent unions. And amid a wave of productive wealth, union membership in Eisenhower’s America reached an all-time high: 34% of wage and salary workers in 1955. In 2011, union membership in the private sector had fallen under 7%, a level not seen since 1932. Of course, back in the Cold War era the government required unions to kick communists out of any leadership positions they held and unions that refused were driven out of existence. Unions also repressed wildcat strikes and enforced labor peace in exchange for multi-year contracts with wage and benefit increases. But as we’ve learned in the last decades, if you’re a wageworker, almost any union is better than no union at all. 4. The government had to get a warrant before it could tap your phone. Today, the Foreign Intelligence Surveillance Act Amendments Act (yes, that repetitive tongue twister is its real name) gives the government vast powers to spy on American citizens—and it’s just been extended to 2017 in a bill that Obama enthusiastically signed on December 29th. The current law allows the monitoring of electronic communications without an individualized court order, as long as the government claims its intent is to gather “foreign intelligence.” In recent years, much that was once illegal has been made the law of the land. Vast quantities of the emails and phone calls of Americans are being “data-mined.” Amendments approved by Congress in 2008, for instance, provided "retroactive immunity to the telecom companies that assisted the Bush administration in its warrantless wiretapping program," which was then (or should have been) illegal, as the website Open Congress notes. There were several modest congressional attempts to amend the 2012 FISA extension act, including one that would have required the director of national intelligence to reveal how many Americans are being secretly monitored. That amendment would in no way have limited the government’s actual spying program. The Senate nevertheless rejected it, 52-43, in a nation that has locked itself down in a way that would have been inconceivable in the Cold War years. It’s true that in the 1950s and 1960s judges typically gave the police and FBI the wiretap warrants they sought. But it’s probably also true that having to submit requests to judges had a chilling effect on the urge of government authorities to engage in unlimited wiretapping. 5. The infrastructure was being expanded and strengthened. Today, our infrastructure is crumbling: bridges are collapsing, sewer systems are falling apart, power grids are failing. Many of those systems date from the immediate post-World War II years. And the supposedly titanic struggle against communism at home and abroad helped build them. The best-known example of those Cold War infrastructure construction programs was the congressionally mandated National Defense Highways Act of 1956, which led to the construction of 41,000 miles of the Interstate Highway System. It was the largest public works project in American history and it was necessary, according to the legislation, to “meet the requirements of the national defense in time of war.” People called the new highways “freeways” or “interstates,” but the official name was "the National System of Interstate and Defense Highways." Along with the construction of roads and bridges came a similar commitment to expanding water delivery systems and the electrical and telephone grids. Spending on infrastructure as a share of gross domestic product peaked in the 1960s at 3.1%. In 2007, it was down to 2.4% and is assumedly still falling. Today the U.S. has dropped far behind potential global rivals in infrastructure development. An official panel of 80 experts noted that China is spending $1 trillion on high-speed rail, highways, and other infrastructure over the next five years. The U.S., according to the report, needs to invest $2 trillion simply to rebuild the roads, bridges, water lines, sewage systems, and dams constructed 40 to 50 years ago, systems that are now reaching the end of their planned life cycles. But federal spending cuts mean that the burden of infrastructure repair and replacement will fall on state and local governments, whose resources, as everyone knows, are completely inadequate for the task. Of course, it’s true that the freeways built in the 1950s made the automobile the essential form of transportation in America and led to the withering away of public mass transit, and that the environment suffered as a result. Still, today’s collapsing bridges and sewers dramatize the loss of any serious national commitment to the public good. Tuition and fees at the University of California system in 1965 totaled $220. That’s the equivalent of about $1,600 today, and in 1965 you were talking about the best public university in the world. In 2012, the Regents of the University of California, presiding over an education system in crisis, raised tuition and fees for state residents to $13,200. And American students are now at least $1 trillion in debt, thanks to college loans that could consign many to lifetimes as debtors in return for subprime educations. In 1958, in the panic that followed the Soviet Union’s successful launch of Sputnik, the first satellite, public universities got a massive infusion of federal money when the National Defense Education Act (NDEA) was passed. The Department of Education website today explains that the purpose of the NDEA was “to help ensure that highly trained individuals would be available to help America compete with the Soviet Union in scientific and technical fields.” For the first time, government grants became the major source of university funding for scientific research. The Act included a generous student-loan program. With the end of the Cold War, federal funding was cut and public universities had little choice but to begin to make up the difference by increasing tuitions and fees, making students pay more—a lot more. True, the NDEA grants in the 1960s required recipients to sign a demeaning oath swearing that they did not seek the violent overthrow of the U.S. government, and that lots of government funding then supported Cold War military and strategic objectives. After all, the University of California operated the nuclear weapons labs at Livermore and Los Alamos. Still, compare that to today’s crumbling public education system nationwide and who wouldn’t feel nostalgia for the Cold War era? In his 1966 State of the Union address, President Lyndon Baines Johnson argued that “the richest Nation on earth… people who live in abundance unmatched on this globe” ought to “bring the most urgent decencies of life to all of your fellow Americans.” LBJ insisted that it was possible both to fight communism globally (especially in Vietnam) and to fight poverty at home. As the phrase then went, he called for guns and butter. In addition, he was determined not simply to give money to poor people, but to help build “community action” groups that would organize them to define and fight for programs they wanted because, the president said, poor people know what’s best for themselves. Of course, it’s true that Johnson’s “War on Poverty,” unlike the Vietnam War, was woefully underfunded, and that those community action groups were soon overpowered by local mayors and Democratic political machines. But it’s also true that President Obama did not even consider poverty worth mentioning as an issue in his 2012 reelection campaign, despite the fact that it has spreading in ways that would have shocked LBJ, and that income and wealth inequalities between rich and poor have reached levels not seen since the late 1920s. Today, it’s still plenty of guns—but butter, not so much. In Eisenhower’s “farewell address,” delivered three days before John F. Kennedy’s inauguration, the departing president warned against the “unwarranted influence, whether sought or unsought, by the military-industrial complex.” He declared that “the potential for the disastrous rise of misplaced power exists and will persist.” The speech introduced the phrase “military-industrial complex” into the vernacular. It was a crucial moment in the Cold War: a president who had also been the nation’s top military commander in World War II was warning Americans about the dangers posed by the military he had commanded and its corporate and political supporters. 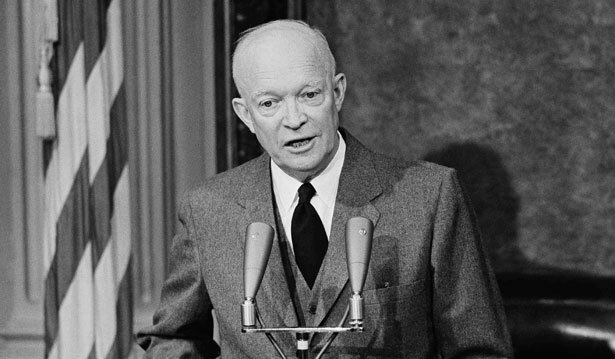 Ike was prompted to give the speech because of his disputes with Congress over the military budget. He feared nuclear war and firmly opposed all talk about such a war being fought in a “limited” way. He also knew that, when it came to the Soviet Union, American power was staggeringly preponderant. And yet his opponents in the Democratic Party, the arms industry, and even the military were claiming that he hadn’t done enough for “defense”—not enough weapons bought, not enough money spent. President-elect Kennedy had just won the 1960 election by frightening Americans about a purely fictitious “missile gap” between the U.S. and the Soviets. It’s true that Ike’s warning would have been far more meaningful had it been in his first or even second inaugural address, or any of his State of the Union speeches. It’s also true that he had approved CIA coups in Iran and Guatemala, and had green-lighted planning for an invasion of Cuba (that would become Kennedy’s Bay of Pigs disaster). He had also established Mutual Assured Destruction as the basis for Cold War military strategy, backed up with B-52s carrying atomic bombs in the air 24/7. By the end of his second term, however, Ike had changed his mind. His warning was not just against unnecessary spending, but also against institutions that were threatening a crisis he feared would bring the end of individual liberty. “As one who knows that another war could utterly destroy this civilization,” the president urged his fellow citizens to resist the military-industrial complex. None of his successors has even tried, and in 2013 we’re living with the results. …But there is one thing I do NOT miss about the Cold War: nuclear arsenals on hair-trigger alert. Our Cold War enemy had nuclear weapons capable of destroying us, and the rest of the planet, many times over. In 1991, when the Cold War ended, the Soviet Union had more than 27,000 nuclear weapons. According to the Federation of American Scientists, these included more than 11,000 strategic nuclear weapons—warheads on land-based intercontinental ballistic missiles (ICBMs), submarine-launched missiles, and weapons on bombers capable of attacking the US—along with more than 15,000 warheads for “tactical” use as artillery shells and short-range “battlefield” missiles, as well as missile defense interceptors, nuclear torpedoes, and nuclear weapons for shorter-range aircraft. We learned in 1993 that the USSR at one time possessed almost 45,000 nuclear warheads, and still had nearly 1,200 tons of bomb-grade uranium. (Of course, sizeable Russian—and American—nuclear arsenals still exist.) In comparison to all that, the arsenals of al-Qaeda and our other terrorist enemies are remarkably insignificant. For more on the US's terrorism-industrial complex, check out Tom Engelhardt on the "best weaponry money can buy."